Edit: Alright, let's expand this thread a bit more so that we can have all the Macross games in one place! I'll also add boards for Macross Plus and the Famicom game (and whatever else there might be floating around) by request or when my fancy strikes me to do so. All the regular rules apply for these games, of course. 3. Damocles 2,505,960 ALL ? Last edited by Perikles on Thu Apr 11, 2019 4:39 pm, edited 16 times in total. Last edited by Kino on Tue Sep 18, 2018 12:21 pm, edited 1 time in total. What a great game! I don't play it too often, but every time I do, it's a blast. Outstanding SNES game this one! Added another table for Choujikuu Yousai Macross 2036 on the PCE! If you want any of the other Macross shooters (Arcade, Famicom) to appear here I'll gladly append them. 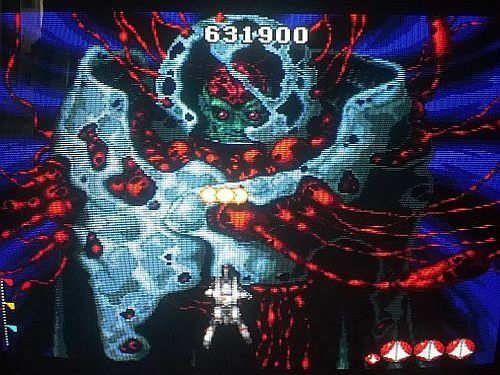 You get 100,000 points for finishing the final boss off, but it is nigh impossible to get a picture of that - it stays like that for half a second, the game can't be paused after dispatching the boss and that's the last you see of your score. Alright, added everything to this thread. I'll probably try to get better scores for II myself, a 2-ALL in the first game might also not be a bad idea (even though it is surprisingly aggravating - there's so much to like, the clunky Thunder Dragon hitbox is just infuriating, unfortunately). What determines how many extra points you get from the final boss in Macross II, by the way? With how much time left you've killed him? Whether you used a bomb? Something else? This really is one of the most approachable NMK games. Up there with Thunder Dragon 2 as some of their best (or er, my favorite) work! It's too bad that it might have some of the most forgettable/irritating music out of any NMK game, which usually shine. I only like the final boss tune. I HATE this!!! I can't even remember what my score was from my clear because the game is so intent on whisking you away to another overlong cutscene. 2036 is a fun and well-made game but it's clear that they cared more about showing off the Haruhiko Mikimoto designs and Shoji Kawamori mecha designs than the game itself! 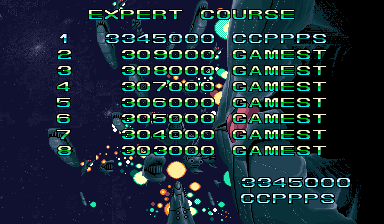 How well does the expert mode in Macross II fare in MAME? There's plenty of old posts saying that it's broken, so i'm just wondering if this is still an issue or if this is just a thing of the past with old versions of MAME. Also, video of my clear. Last edited by Square_Air on Fri Mar 16, 2018 11:44 am, edited 1 time in total. It's fine now I think. Yeah, I'm pretty sure Macross II was part of "the NMK fix" that also fixed the sound, which used to not work in some games (Rapid Hero) and half-work in others (Gunnail). This was... 2013? It was a good while back. [...] a 2-ALL in the first game might also not be a bad idea (even though it is surprisingly aggravating - there's so much to like, the clunky Thunder Dragon hitbox is just infuriating, unfortunately). Skin-of-my-teeth clear, died out of mind-debilitating avarice in 2-6 and then some more all the way to the end, one bomb less and the final boss would've overwhelmed me. I only had to tweak my strategies a little bit, I do enjoy the game considerably more now, though. 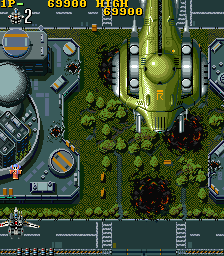 The Macross series in general was graced with several great shmups now that I think about it, the Famicom game looks rather pitiful nonetheless. Where are all the tournament Macross II scores, by the way? And why couldn't anyone answer my question regarding the bonus on the final boss in the selfsame game yet? Lazy bums. It's 10k per second remaining up to 10 seconds, at which point it maxes out at 100k (i.e. there's never any extra bonus for beating him earlier than that). He always becomes vulnerable again after his final laser blast with just on 9 seconds remaining. I'm still debating whether or not it's better to finish him before it or ASAP afterward and get in as much extra ground spawn milking as possible. Clear #50, wew! Just dropping off a basic 1-ALL score to keep Perikles company on the board. This came from a 2 day session of curiosity in between other clears while I'm feeling too sick to focus on anything too challenging . This is a neat little game despite the shoddy hitboxes, questionable visibility, and cruel all angles assault in the last stage. 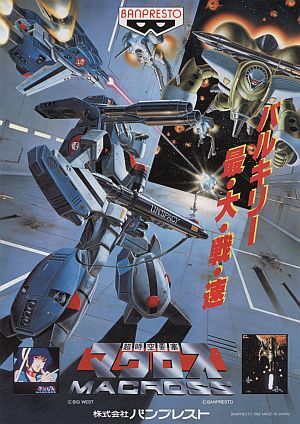 Macross feels very much like NMK's step in the right direction towards their quality games that would follow. 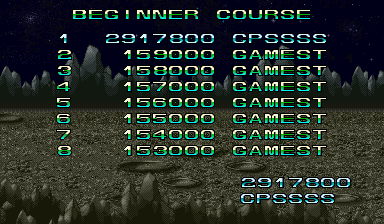 I was hoping to get further in the second loop since I cleared with an extra life in stock, but the suicide bullets of 2-1 had other plans for me. Small update. I wasn't satisfied with my last score and decided to push further, though I unfortunately ran straight into the 2-4 boss like a fool! I keep trying to move on from this game, but I just keep playing it. 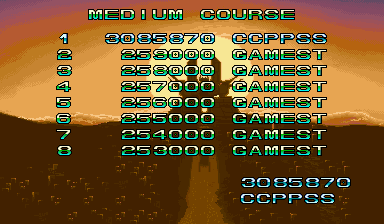 With how close I am now to either the 2-ALL or the top score I'm feeling like it would be a shame to quit at this point. First loop went terrible, lost 2 lives to stupidity on the 1-6 eye and the rest to 1-7, but I no missed to 2-6 which really beefed up my score. After crawling all week in tiny increments, I finally cracked 7 million. Died right before picking up the Armored Valkyrie at the 2-7 turret section with the 2 Minmays only moments before the last boss . My scoring was relatively solid for most of both loops, minus the disaster of missing the 1-6 fish head. Most of the points I'm missing come from a combination of thorough boss milking and scoring on 1-7 & 2-7. 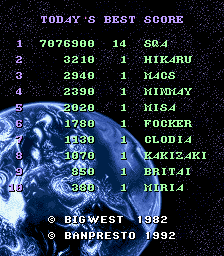 I also didn't know about the clandestine stage 3 Minmay until after this run, so there's still plenty to improve upon. Always destroy the 1-5 & 2-5 miniboss mechs as both are worth a ludicrous 500,000 points each (and the first always gives an extend upon destruction), making up ~10% of the world record and ~14% of my score just from a few seconds of shooting. Bombing them is a good idea since the 10k you lose is nothing compared to how much they're worth (unless you want the WR of course). Take note though, if you destroy either of them too low on the screen, they will fall off before they explode which will net you no points. If you miss out on either of them, your scoring run is over. 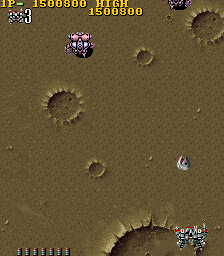 The 1-4 & 2-4 miniboss mechs that look identical to the variant above (it's probably the same mech since it always leaves the screen intact) are worth absolutely no points at all and you should never waste your bombs on them. There is a safespot in the top right corner of the screen that you should abuse to never have to deal with these again. 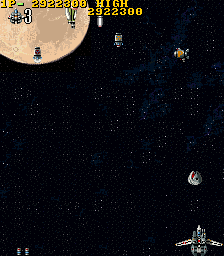 You can milk the asteroids on the second boss, the zako on the third, the missiles on the fourth, and the lasers on the fifth. The lasers on the fifth boss are particularly lucrative, and the generous length of the boss timers allows you to milk for upwards of seven minutes x_x. Knock yrself out. The final boss can also be milked in a sense by only shooting him with the side of your Armored Valkyrie shot to do less damage and procure more scoring hits. If you do not have the Armored Valkyrie and are about to pick it up, always wait a full second before picking up any other weapons (Fighter, Battroid, Gerwalk) as they will strangely overwrite the Armored Valkyrie. You always want the Armored Valkyrie for scoring and survival. Minmays are worth 50,000 pts and collecting 4 of them will drop an extend. 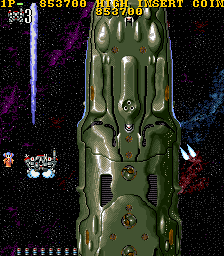 Minmay #1 is simply to the left of the first boss before it takes off. 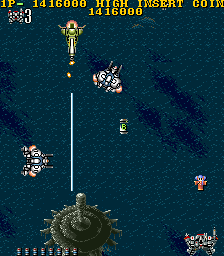 Minmay #2 is to the right of where the 2 crane-looking enemies appear 2/3rds of the way through stage 2. Minmay #3 is the clandestine stage 3 Minmay I mentioned. It appears on the very left just after the last battleship turret appears on the screen. 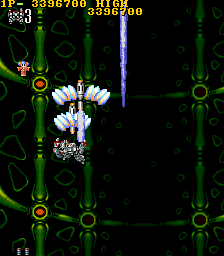 You need to be quick as this Minmay will fall much faster than the others due to the increased movement of the screen during the boss. Minmay #4 is to the right of the tower in the water about half way through stage 4. 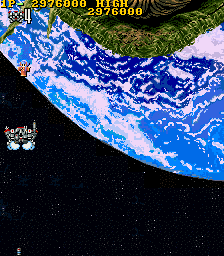 Minmay #5 is on the left side of the screen by the Earth in stage 6 right before the boss. Minmays #6&7 are at the edges of the screen at the turret section right before the final boss in stage 7. Fish heads are worth a whopping 100,000 pts. 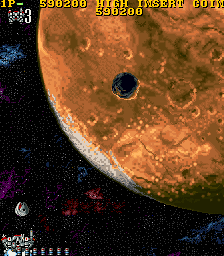 Fish head #1 is to the left of this planet near the beginning of stage 3, right after the opening miniboss. Fish head #2 is on the right side after the water section in between the grey mechs and the red mechs in stage 4. 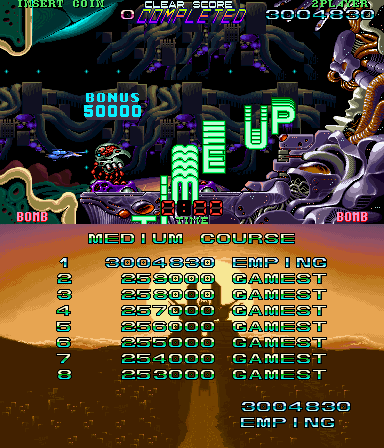 Fish head #3 is on the right side and appears in stage 6 just after the green enemies with arms pop out of the bottom of the screen, and right before the moon shows up on the left side. This game is really charming, but you have to contend with the jank if you want to succeed. I still haven't decided if I'm going to push for the 2-ALL yet, I'm still pretty salty from snatching defeat from the jaws of victory earlier today. One of NMK's Magnum Opus, great and packed with fun! 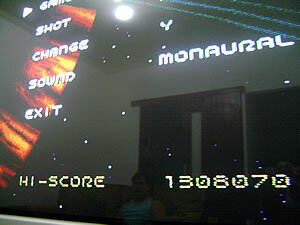 As mentioned, the final boss is worth 100,000 points, getting a picture of the final result is utterly impossible. -VF-19 is undoubtedly the most powerful ship in the game, especially with its Gerwalk mode (Orange G power-up), Fighter (Blue F) is ok but avoid the Green B power up as it's very weak. -Extra lives are given by destroying a certain number of enemies with your charged missiles (this includes the missiles from the blue planes and boss parts), I think the exact amount is between 100-110 enemies. -You cannot carry more than 5 bombs and you don't get extra points for grabbing one more so it's best to use a bomb before grabbing it. -Some bosses have unavoidable patterns due to the huge hitbox. 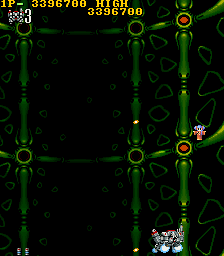 -The second loop is kind of same as the first loop with the bosses and enemies having the same health and there are no suicide bullets (Except from the "cubes" at the beginning of Area 7 on both loops) except they are more aggressive and shoot faster. -For some reason, if you manage to beat both loops you are not able to enter your initials (thus no high score in the scoreboard!!!) so take a picture during the credits. By now I'm not in the mood of doing the 2-ALL. 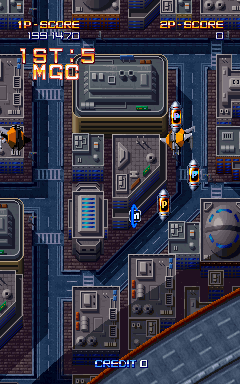 It's come to my attention that the there's also player side differences in Macross I with the 2P ship being faster. Looks like we have another Macross game where 2P side is superior, and all the Japanese replays seem to confirm this. My run was on the 1P side, but when I return I'll definitely be switching to 2P side. After a quick kusoplay of the first few stages, I already feel like the game is a much more comfortable and enjoyable experience with the added speed.